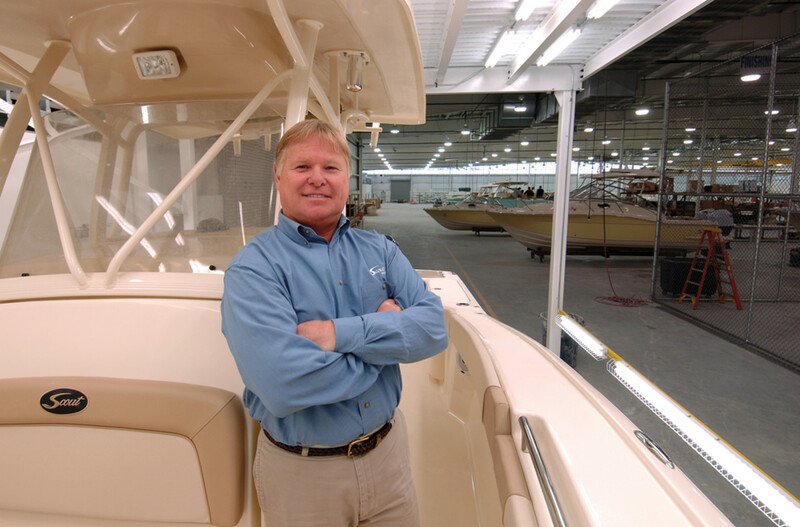 Steve Potts doesn’t reflect a lot on the history of Scout Boats, but the Mount Pleasant, S.C., builder’s 25th anniversary this year prompted him to take a look back at what has led to Scout’s double-digit post-recession annual growth. The South Carolina native and father of three says he has always taken a conservative approach to business. That approach enabled Scout to enter the Great Recession debt-free. Soundings Trade Only caught up with Potts to ask him about starting his boatbuilding business with the $50,000 he was able to squirrel away in the 1980s, and working a night job repairing fiberglass bathtubs and during the day as plant manager at American Sail. We also got details about the expansion Scout is undergoing to begin production of its largest boats ever ­— a 38-footer and a 42-footer. Q: Scout has been a real success story during some tough times. How did you get the company going and what were some of the early hurdles? A: It was a very humble beginning — just myself, my wife [Dianne] and a helper, literally in a brick barn or a garage. Having been in the marine industry since I was 14, I knew that one day I wanted to do my own thing and apply all the things I’d learned to do and learned not to do. So I made up my mind in the mid-’80s to start working hard — besides raising a family and coaching soccer and doing all the other things dads do — to start working toward saving money and starting my own business. I didn’t know any way to go about it other than the old-fashioned way, which was to do side jobs, work and put as much money away as I possibly could. I made up my mind that as soon as I made $50,000, that was going to be at the point where I was going to start my business. So I did. When we started, I knew the business model had to be something very simple and conservative. 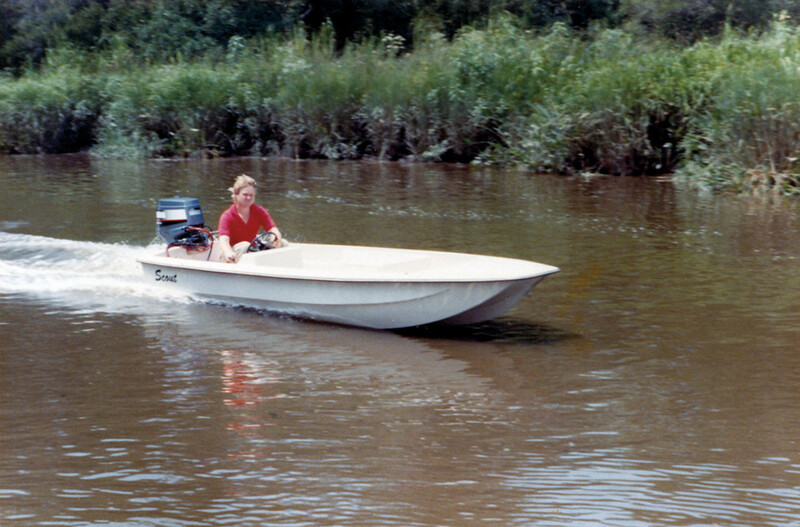 So we started out with a little 14- and 15-foot design that was sort of a derivative from the mid- to late-’60s, when I worked for a little local dealership that built a boat called Scout. That boat was built for five or six years. I worked there after school and in the summer in my teen years. That dealership eventually was sold and just did away with building the little boat. I’d say sometime in the early ’70s that little design and that name went away. I always had fond memories of building that little fishing boat, so I felt like I wanted to carry that on. That’s where the name Scout came from. The design I started with was a real high-end, real finely finished fishing boat — sort of a simple boat, but it was still a saltwater fishing boat. We had the business going from February 1989 and had a handful of dealers — seven or eight — in the Carolinas. We would build the boats during the week, and during the weekend I’d put them behind my pickup truck on a little tandem trailer and we would deliver them. That’s how we got started. It felt pretty good. I was living my dream and paying bills and making ends meet and doing little things when I had time to develop different and bigger models. And then Hurricane Hugo hit, on the 22nd of September 1989. The building we were in was pretty much leveled. It was a brick building with a galvanized roof. When we got to it a couple of days after and saw what was left of what I’d worked for for so long, my emotions were really anger and determination. I had worked and struggled too long not to continue on. It was really myself, my wife, and at the time my 12-year-old son, who today is the vice president of development, and my 9-year-old daughter. We basically as a family, brick by brick, unloaded what was underneath the building that was leveled and we salvaged what we could. We were able to get some things going again, and then ironically, Dec. 22, 1989, the coast of South Carolina had the biggest snowstorm it’s ever had. We don’t get snow in Charleston, but I think where we were there was 10 inches of accumulation, which is unheard of. When our first building initially got wiped out, we found one of the very few buildings that survived Hurricane Hugo not far away. It was a galvanized shed with a dirt floor. We put the pieces back together. The guy I was renting the brick barn from rebuilt and we moved back in February or March of 1990. For the next six months, we were sort of back where we started. One of the things that’s unique about Scouts is the fit and finish. The bottoms of all of our fiberglass lids were polished. Our bilges were polished. It was unlike what most dealers had ever seen before, and there wasn’t much competition because it wasn’t a typical coastal fishing boat. It was something better than that. That show was kind of a depressed show, but when we came away we had list of 31 dealers that wanted to sell our little boats. It was, I guess, from famine to feast. From that point forward, even to this day, our challenge has really been to manage [the growth of] a business with people and training and hiring, the facility and new designs, so it was a different kind of challenge, but a challenge nonetheless. We had aggressively grown double digits every year. Things were going well, and we were very profitable and the next big challenge that hit us was the Great Recession. But we came out of the period between 2008 and 2010 with 18 new models. During that two-year period our competitors hardly came out with anything. Because we developed so many new models, we kind of reinvented the company. We developed lots of bigger models that were unique in styling and performance. Everything we put into them has really paid off. Today and since 2009 Scout has had, on average, better than 25 percent annual growth. Scout was one of the early companies to build creature comforts into fishing boats. Q: There seem to be roughly the same number of builders as before the recession, despite so much hardship, but not all have thrived the way Scout has. In fact, some of the smallest companies grew share the most. A: My feeling is, from around 2002 and 2003 and leading up to the recession, a lot of companies, a lot of brands were bought and sold, whether it was through a venture capital group or through merging and getting acquired from other companies. My feeling is that in a lot of those cases it’s somewhat of a bean-counter mentality. When companies start calling boats ‘units,’ I think they lose a little touch of what we’re all about. 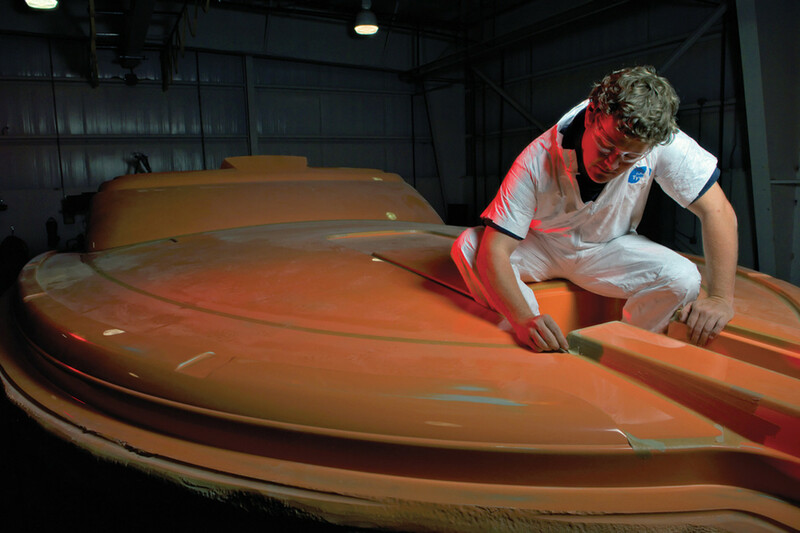 As a boatbuilder, there’s a difference. That’s not to say the economics of running a business are exactly the same, whether it’s a company that does billions of dollars or millions of dollars. I understand that. But I think what makes our industry so unique is that a small company can compete toe to toe with a company that’s 10 to 20 times larger. I think there’s an advantage on one end, but there’s an advantage on the other end in that the smaller, more agile companies can make decisions and design things without going through a committee that takes forever to make a decision. At the end of the day, being a business that’s very labor-intensive, it’s about how well we deal with human behavior. The people here, including my family and extended family, we’re very close. We’re very driven as a group. We do a lot of things that are unique. We meet every month. We review everything with our employees. We are very transparent and very inspirational. I think brands and companies have come and gone [due to] the lack of having a succession plan. Meaning, once the founder has moved on and is in their twilight years, they step away from it and there’s not the youth behind them. That’s just the opposite here. I want Scout to be successful long after I’m gone. 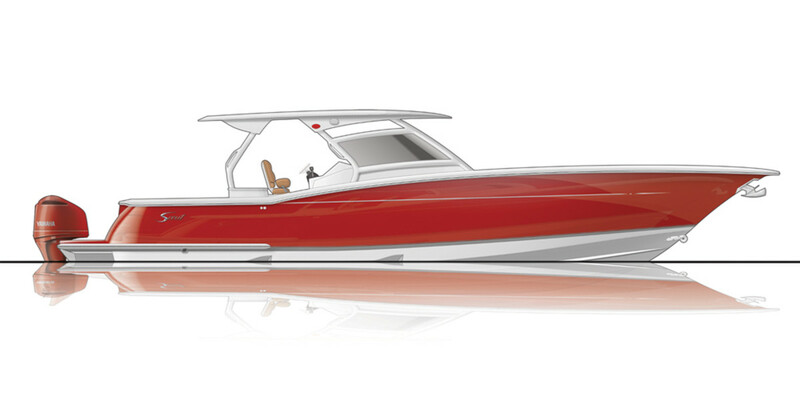 Scout&apos;s 420 LXF, in development for three years, will be introduced in February at the Miami boat show. Boatbuilding is very passionate. It’s very personal to a lot of people. It’s part of their character and their designs, and I think once you lose that and you get a big group of people that is just going through the motions, I don’t think it’s the same. Q: Many companies that actually grew during the tough years say they were conservatively run, which enabled them to step up model rollouts in those lean times. Has that given companies like yours an edge that it will be difficult for others to catch up with? Do you think the smaller companies will emerge most healthy from this lingering downturn? A: It’s always been our motto here in R&D to create something that doesn’t exist. There’s no question that today there’s as many shapes and colors of fiberglass floating around as ever before. So it isn’t for lack of creativity. As an industry, one of the things we’ve really tackled is doing some different things with the features, having the electrical and electronic systems be more integrated so it’s more like other consumer products. In a lot of cases our industry goes back two and three decades in technology, even so much as analog wiring. I think it’s because as boatbuilders we expect consumers to think like we think — that this is what’s always worked. You don’t need anything different. Having 30 switches on the dash on your boat is cool. It’s what we like. The fact is that we as boatbuilders can’t expect consumers to think like we think. When you get somebody that spends the kind of money that is spent on our models and they’ve experienced an automobile that’s in and around that same budgeted price, every other thing they’re exposed to [is more user-friendly]. They’ve got a 3- by 5-inch smartphone that can do 10 times more than you got on a boat, so the boat seems antiquated and dated because it’s not condensed and user-friendly. A younger Potts races an early-model Scout back in the day. Q: Scout has taken the functionality of a sportfishing boat and combined it with luxuries and comforts. Has that approach resonated with people other than anglers? A: I’m glad you mentioned that because that has been a struggle. Seven or eight years ago, we started paying a lot more attention to the creature comforts. Our upholstery wasn’t rectangular or square cushions that were wrapped in a vinyl. We started sculpturing the seating and introducing some new contrasting colors and doing a lot of things like that. Early on, we were scrutinized, especially by our competition, that it was too pretty. I used that same analogy. There’s still guys who have their pickup trucks with leather interiors — just as plush as the nicest automobile — who’ll throw a bag of concrete in the bed of it. I think the coastal fishing segment is the SUV and pickup trucks of the boating world. That’s who we are. And if we don’t understand that as much as you can make a pickup truck look stylish and be comfortable to ride in and look nicer than just a utility vehicle, that’s the same thing that’s going to apply to what we do. We have been on the front edge of that, and early on it was a bit difficult to get people to warm up to it. Our competition would say, ‘You want to get blood and guts all over that nice interior?’ But if you look at it today, it’s more the norm and not the exception. Q: This segment has been one of the few we’ve seen make a rebound. Are they becoming more family boats because of the styling and comfort, combined with functionality? What else is helping the popularity of these boats? The 300 LXF was showcased at this year&apos;s Fort Lauderdale show. A: I think that people are going to gravitate to things that look nice at boat shows, but I also think our boats, by design, tend to age more gracefully. Even though we add the plushness to them, you can still hose them out and not have to baby them. I think that’s what consumers want today. I don’t know that consumers want to labor over a boat. They want to enjoy it, they want to use it, and after it’s three or four years old they don’t want it to sit out there and not be used because it’s all ragged out. With the advancements of the materials that are being used, and with all the things the coastal fishing boat market is doing to build a better product, I think people are gravitating toward that. Maybe that’s where they want to be, rather than a runabout or cruiser or some other type of boat. That’s just speculation, but that’s what we hear. Q: And what about the shift into larger boats? I’ve heard you say that Scout is venturing into some larger models. Do you think that’s part of a larger trend? A: For our brand, Scout still builds from 17 feet to now 42. We will not vacate the small boats, just because we have always had the philosophy that we want to keep people in our brand. If it’s a young couple out of school just starting their careers and their budget means they’re going to be able to get a 17-foot boat, as long as we’re doing our job we want to be there for them. There’s a lot of big-boat-itis out there. Some of it’s kind of reversed and gone the other way. Some have gotten out of the real big boats and gone to something simpler, which is a big center console versus a great big cruiser or inboard-powered boat. We’re going to continue to build a very diverse model mix. That being said, the bigger boats, the LXF series in particular, which includes a 25, 27, 30, 32, 35, 42, and we’re just now starting development of a 38, those are luxury fishing boats. LXF for us is luxury fishing vessels. Those designs are very versatile. If someone wants to tournament-fish, they can. They can use them as a tender, as a cruiser, and some of the boats, the 35s and 30, we have accommodations below deck that can make them a weekender if they want that. Q: You’re adding factory space. Are you expanding your current footprint or adding buildings? How much are you growing? A: Having a conservative philosophy about growing the business, the facility that we have now is all under one roof and it was built in five phases. Our main building is approximately 180,000 square feet. In that building we have what we call Plant A and Plant B. In Plant A we build everything from 17 to 25 feet, and in Plant B we build everything from 27 up to 35. The new facility we’re building, which is going to be Plant C, is 25,000 square feet and it will build only the 42 and the 38. The reason we have segregated those two boats — we have separate stockrooms, separate management, separate offices, separate everything — is because the methodology in building the small boats versus the large boats is different. Q: And that plant will cost $2.5 million? A: That’s right. But in addition to the building, we’re expanding our parking lot. We’ve also spent a fair amount of money to get some new CNC cutters. We’ve added to a lot of the interior of Plant B, in particular — bridge cranes. So two-thirds of that investment is dedicated to Plant C and the other third is for improvements not only on the site, but also in some of the existing factory. Q: How is your work force projected to grow? A: We’re right at 240 employees now, and my five-year plan going forward that’s going to take us to 2019 is to be at 500 employees. Q: How many boats are you building a year and will that also change? A: Today we’re right at 850 a year. Obviously our revenue’s going to grow quite a bit because of the introduction of the 42 and the 38 and some of these other bigger models. The number of boats we produce will increase moderately, but not nearly as much as the revenue side because the bigger boats have so many more dollars in them. Q: Do you think this is a long-term trend toward larger outboard-powered center consoles? 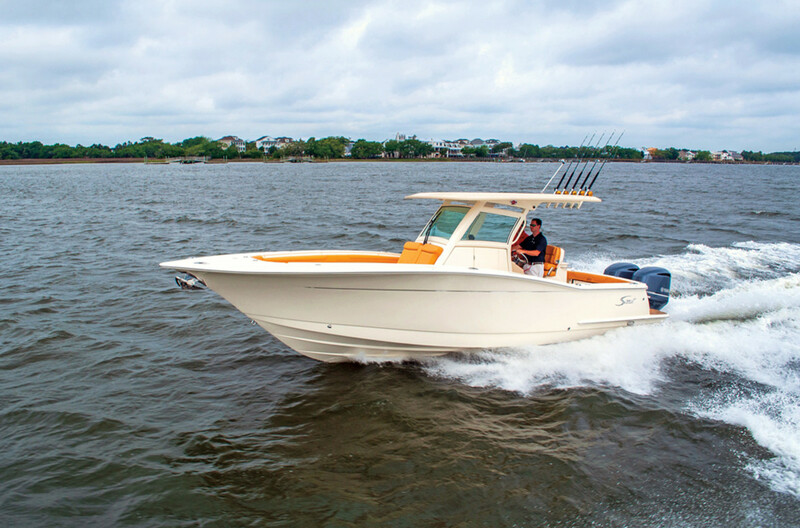 You alluded to competitors, but there aren’t many in this larger center console coastal fishing boat space. Can you speak to that? A: As you start getting in the arena of boats that sell for six figures and above, there are a lot less builders and a lot less competition. I think there is market share for us to gain. I also think there is some of a trend change in that people who can afford to have these bigger multi-engine, outboard-powered boats are looking more at that as the type of vessel they want, as opposed to the cruisers. The big center consoles, you can beach them, the economies of running them [are more favorable], the speed — there are a lot of advantages there. There are very few disadvantages that you see with the big stay-in-the-water-type boats. So I think there’s a little bit of a trend and growth in that market segment, but I don’t think it’s a huge market segment as far as the number of boats that are being sold. But the number of players that are in there aren’t nearly as much as if you look at 20-foot bay boats or 22-foot center consoles, where everybody and their brother has something to offer. It takes a lot of infrastructure for you to be a player in that style of boat. Your engineering support and your quality control and quality assurance programs — it isn’t something you can take a simple-minded culture of building small center consoles and say, ‘OK, we’re going to build these big boats.’ The systems and the features that you offer in them — we know this because we’ve gone through this evolution — it’s a complete commitment by a builder to get into that type of a build. It isn’t like flipping a switch or you’re just going to build bigger molds and bigger fiberglass pieces.That’s probably going to limit the number of people getting into it. Q: With all Scout’s growth, how has production changed? Have you been able to keep up with demand and what kind of backlogs do you have? A: With some models, as much as six months. We have one or two that are even longer than that. We’re conservative about the ramp-up on something. If we’re sold out to some future date, we are very cautious about not overcommitting or having the blind leading the blind out here as far as having too many people being trained. We’re probably conservative as it relates to most other builders in that we don’t work outrageous hours, we just don’t do some of the things. … Again, I’ve learned what not to do. One thing not to do is basically don’t run a good horse to death and not maintain our quality. We are very conscious of making sure that we maintain quality and efficiency. Q: How do Scouts hold up for resale? Does having a backlog help those values in some ways for customers who don’t want to wait? A: I think that’s true. I think there’s a lot of brands that create a glut of late-model used stuff. Either people getting out of it or moving in a different direction or whatever. I certainly wish a lot more consumers would pay attention to their investment and not just what the salesman says or the big and shiny boat you see at the boat show because it is a big investment. How gracefully that brand ages and the reputation of the brand is really tied to what their investment and resale value would be. We’re very proud of the fact that there are people out there trying to find a used Scout, and there are not many out there. The ones that are out there, those customers are proud of them. That helps us with the brand image that we have. Boats are like everything else: you get what you pay for. Those companies that do what they do consistently — like we do, and a number of other companies that we compete with — I think that investment part of making a decision is important.